Properties in Ahmedabad with fabulous features for a modern-day lifestyle! Property demand in Ahmedabad has led to a rise in residential projects. If you are looking for premium luxury that will be loved by all, look no further! Adani Shantigram Water Lily is a distinguished residential project in Ahmedabad by Adani Realty that offers luxury and comfort to the core! This development rests elegantly on a bed of 32 acres and contains 15 glorious towers that offer 3.5BHK, 4BHK apartments & 4BHK, 5BHK penthouses that are packed with luxury and comfort. The areas of these amazing residential spaces start at 2443 sq. ft. and go up to an incredible 6440 sq. 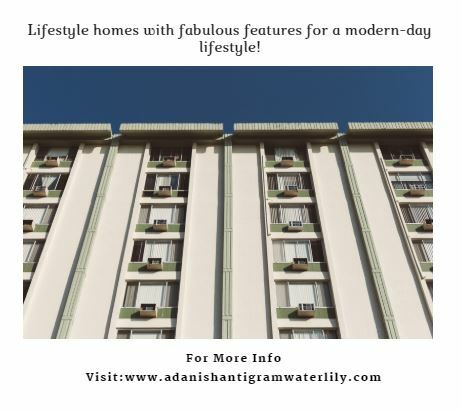 ft.
Adani Shantigram Water Lily Ahmedabad is a spectacular residential development that offers internal & external amenities for a modern-day living that will satisfy your soul! You will find apartments and penthouses that contain high-end fittings, beautiful flooring, tough doors, wide balconies and windows, kitchens that are nothing short of fancy, intercom facility and other safety features. The external amenities at this development are crafted for comfort and include a clubhouse, swimming pool, theatre, sports facilities and a play-area for kids, multipurpose hall, shopping centre, 3 elevators per tower, landscape garden, car parking facility and top-notch security. 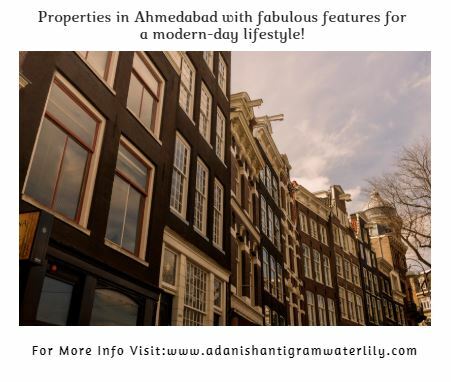 Situated at S G Highway, a popular locality in Ahmedabad, Adani Shantigram Water Lily S G Highway offers a life of convenience as it has a number of landmarks in its vicinity. In fact, no lace is hard to find when residing at this development. From schools and colleges, to medical centres, hospitals, banks, ATMs, malls, shopping centres, retail outlets, convenience stores, cafes, restaurants, etc., you can find and accessed them all within a matter of minutes. Starting at an exclusive price of Rs.89 lakhs and going up to Rs.2.81 Cr., the Adani Shantigram Water Lily Price caters to every budget and requirement. Yu can also choose from different payment plans along with NRI services, home loan facilities and more for a simplified purchase.